There's a £75 Reward Card up for grabs with Plusnet's already cheap broadband deals. Get it before it's gone! The countdown is ticking down quickly on your opportunity to grab the best cheap broadband deal in the UK from BT-owned internet provider Plusnet. When it hits midnight tonight, the deal will be gone. And what does today's best value broadband deal look like? 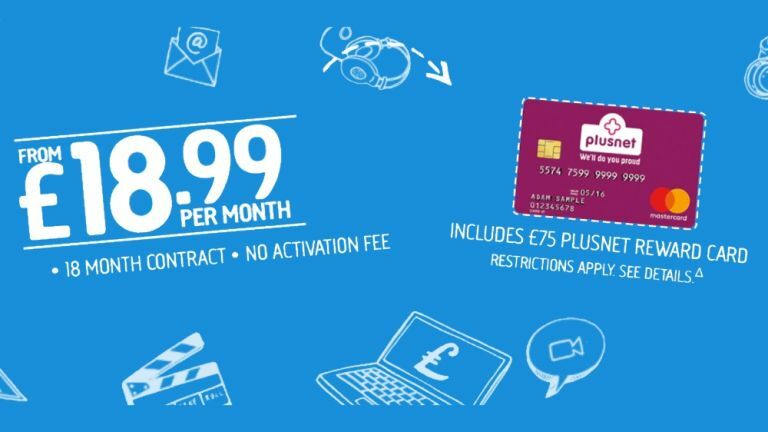 Plusnet Unlimited Broadband consists of low monthly bills, free activation and a £75 pre-paid credit card that can be spent anywhere online or in store that Mastercard is accepted. The overall effective cost for the 18-month contract is under £275 and amounts to less than £15 per month. No other provider comes close at the moment. As if £18.99 per month wasn't tempting enough in its own right, the £75 reward card Plusnet is chucking in makes this deal truly fantastic. Free activation doesn't hurt, either. Line rental is included, and Plusnet has other options to add evening, weekend, anytime and international call plans as well. If you're a current Plusnet customer, unfortunately this offer doesn't apply to you. Similarly, you're not permitted to claim this promotion if you've had Plusnet before. This sensational offer is only for customers that are new to the provider.